Swedish company Alligator claims to make the world’s best chopper. And thanks to that renowned Scandi simplicity and energy, there’s no doubting this. Alligator make the laborious task of chopping fruit and vegetables quick, safe and fun. With the Alligator Chopper, you can have perfectly diced onions, tomatoes, or potatoes in one easy stroke and it’s far safer than a kitchen knife..
Now with the Alligator 2-in-1 Set you can also have chips. It comes complete with two interchangeable multi-knife chopping grids and the food collector tray. This simple-to-use gadget features a compact design and is perfect for use with your favourite ingredients. Simply place your foods on the small grid and push the top section downwards – in seconds, your food is finely chopped and is pushed into the clear food collector ready to be tossed into your dishes or ready to be deep fried as homemade chips. Delicious. 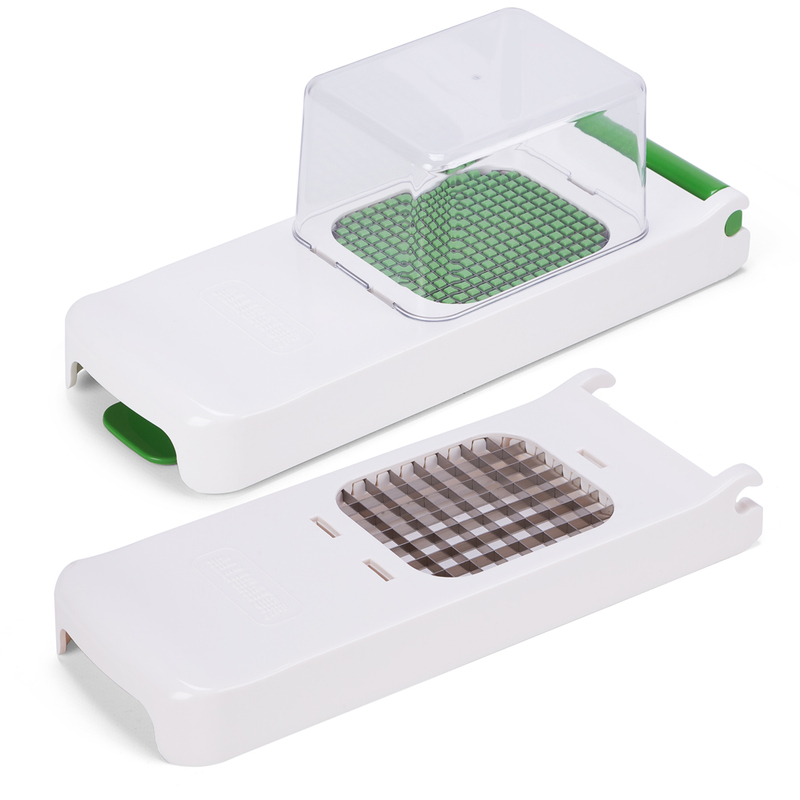 Equipped with two sharp stainless steel cutting grids..
Small cleaning grid is perfect for removing debris from the chopping grid on the base. 6mm (l) x 6mm (w) – Chopping Blade. 12mm(l) x 12mm (w) – Chopping Blade.